Wireless technology has gained tremendous popularity over the past few years, but is it the best method for every networking application? In certain situations a wired connection may be the best choice for extending your home or small business network and for the uninterrupted streaming of media. A wired connection is still the most stable means of communication. Wireless routers are more susceptible to interference from other electrical devices (such as microwaves, cordless phones, garage openers) than their wired counterparts. This can negatively impact the quality of the signal, not to mention the mood of the users. Depending on the physical layout of the building, a wireless network may simply not function in all user areas. This is particularly true in situations where a room is located in a basement setting, or in a very large home where multiple rooms are involved and wireless signals can often be interrupted. Most may not know that wired networking is almost always faster than wireless. Finally, a wired network can be more hardened from a security perspective. Just think of it—in order to “hack” your wired network, the hacker would need to have physical access to your router or adapter. A number of manufacturers have realized the promise of HomePlug networks for streaming media and are introducing adapters that take advantage of a home’s existing electrical wires to establish an entire network with no additional wiring. 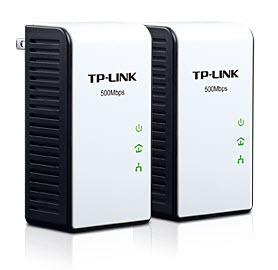 TP-LINK’s model TL-PA511 AV500 Gigabit Powerline Adapter Kit, as an example, comes equipped with two adapters, each of which provides up to 500Mbps data transfer rate at physical layer on a line length of up to 1000 feet (equivalent to the length of 10 basketball courts). Users simply plug one of these adapters into a power outlet and connect the networked devices into the other adapter that acts as a router. It’s as simple as that to create your own home network comprised of all your devices-computers, game consoles, printers, etc. You’ll be ready to enjoy the stability and speed of a wired network for HD video streaming movies, games, email, Voice on Demand, online music, photo sharing and more. The fact that so many flat screen TVs, Blu-Ray players and surround systems now come equipped with built-in Ethernet makes it even easier to create your own in-home network that includes your TV, your computer and other devices to take advantages of high-definition services provided through Hulu, Netflix, Roku and others. Plus, the speed of these wired network systems makes them ideal for providing the smoothest possible video streaming and HDTV networking. Most of the adapters designed for creating in-home wired networks provide multiple ports to allow numerous devices to be connected to the adapter. This list of devices could include whatever communication electronics you have in your home, such as a flat-screen TV, a cable box, a DVD player, a digital video recorder (DVR), a home theater system and, of course, your Internet connection. An added benefit offered by some of these types of adapters is their power-saving feature. When there is no transmission of data for a certain period of time, some units automatically switch to a “power-saving” mode, thus reducing energy consumption. As we mentioned before, many of the adapters currently on the market use existing wiring in a home and are easily installed by the end-user. This is a huge advantage. Many of us would cringe at the thought of the work involved in rewiring our home or the cost associated with paying someone else to do it. Fortunately, several manufacturers have taken this to heart and are offering products that simply plug into a home’s power outlets and take advantage of the existing wiring to create a complete home network solution. Richard Xu is the Vice President of TP-LINK USA, a global provider of high-quality networking products at affordable prices. Click here to learn more about their Powerline networking solutions.